JUNEAU, Alaska (September 2012) - Beer drinkers in Europe will soon enjoy a "taste of Alaska" when Alaskan Brewing sends their award-winning Alaskan Smoked Porter across the pond this fall. The first shipment of 22 oz bottles of the 2012 Alaskan Smoked Porter departs for Europe in late September where Amsterdam-based Bier&cO beverage distributors will distribute the Porter to select locations in Europe. Alaskan Brewing chose to send exclusively their Smoked Porter because it has the longer shelf life to support the long travel time and distance to Europe. "As far as we know, Alaskan Smoked Porter has no end to its shelf life. We are still enjoying vintages from our cellar that date back to 1993," explains Alaskan Brewing cofounder Geoff Larson. "We can be confident that despite the extended travel between Alaska and Amsterdam, consumers on the other side will receive the same quality beer experience as those who enjoy it here in the states. The dark, robust body and pronounced smoky flavor from in-house alder-smoked malt, make this vintage-dated beer an adventuresome taste experience. 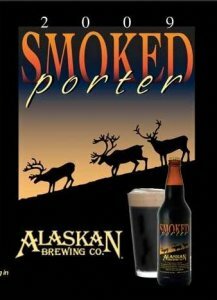 Alaskan Smoked Porter is wonderful when fresh or cellared for enjoyment in years to come. The reputation of Alaskan Smoked Porter made its way to eager craft beer fans overseas thanks to Gold Medal wins at the Great American Beer Festival, European Beer Star Awards and the World Beer Cup. Bier&cO is based in the Netherlands, but distributes throughout the EU. Alaskan Smoked Porter will be available in United Kingdom, Holland, Denmark, Norway, Sweden, Finland & Italy. Alaskan Brewing Co. has been making award-winning beer in Juneau, Alaska, since 1986. The Alaskan Brew Crew bottles the unique character of the Last Frontier with historic recipes, local ingredients and glacier-fed water. Alaskan Brewing handcrafts Amber, Pale, White, IPA, Stout, Smoked Porter, Winter Ale, Summer Ale and an array of limited edition beers in the Alaskan Pilot Series. Visitwww.alaskanbeer.com to learn more and connect with Alaskan atFacebook.com/AlaskanBrewingCo and @AlaskanBrewing on Twitter. Bier&cO is headquartered in Amsterdam, The Netherlands. It is a leading European Import-, Export- as well as Wholesale company focused on craft Breweries and their Beers - dedicated to make unique beers from all across the globe accessible to a larger audience.